If you need a relaxing holiday destination surrounded by mountains and crystal clear lakes, then Macedonia is the best choice. Placed in the south-east of Europe, in the Balkan Peninsula, Macedonia has borders with Serbia in the north, Albania in the west, Greece in the south and with Bulgaria in the east. Due to its wonderful landscapes offered by the high snow capped mountains, emerald green valleys and clear water lakes this country attracts lots of tourists every year. The country’s location in the Balkan Peninsula and its predominant mountainous landscape are the main ingredients for a mix of Mediterranean and temperate climate with hot, dry summers and cold wet winters. Of course height is also an important factor, the highest mountains being an ideal place for tourists escaping from the torrid Mediterranean summers. In the mountains winter is long and snowy and summer is short and chilly. The highest peak is Mt. Korab (2764m). We must also mention that Macedonia is one of the former Yugoslavian Republic countries, declared independent in 1991. Macedonia’s flora, due to its geography, is mainly made up of forests. Some of the many animal species populating these forests are the bears, foxes, deer and many more. There are 33 natural reserves in the country where any tourist can enjoy nature in all its greatness. If you decide to visit Macedonia you must know that a valid passport is required, you also have to declare your residence within 24 hours from arrival and also the entire foreign currency. The national currency is the Macedonia Denar but Euros are widely accepted too. Macedonia has a good transport infrastructure with a well developed network of roads and railways, international and local airports linking the major cities of the country and the country with the rest of the world. The major airport in the country is the Skopje International Airport welcoming tourists from all over the world. Traveling within the country is possible by car, train, airplane or taxi. 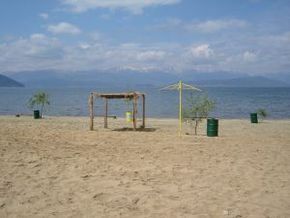 There are endless accommodation possibilities in Macedonia. Hotels classified according to the number of stars offer private facilities and a relaxing atmosphere to help you enjoy a perfect holiday. You can also choose a hostel with less facilities but low prices or go camping in one of the many campsites throughout the country. A representative choice for a high class hotel would be Inex Gorica Hotel, situated on the shores of Ohrid Lake, surrounded by pinewood, offering good location at 15 kilometers from the airport, private beach at the lake, spectacular landscapes and all possible facilities for business travelers too, like congress hall, conference hall, internet connection etc..
Another accommodation option for the ones in search for a vacation closer to nature would be the Vodno Hotel located in the heart of Vodno Mountain near Skopje at 700 m height above the sea. This location offers fresh air, spa, relaxation facilities, wonderful landscape over the Skopje Valley and well equipped rooms in order to satisfy even the most demanding guests. Whatever you may choose, Macedonia will surprise you with its wonderful landscapes, rich flora and fauna and crisp air of the mountains. Macedonian cuisine is diverse, its main influences coming from the Greeks, Turks, and Middle East. Due to its variety one might consider it as a representative cuisine for the Balkans. Its main ingredients are the vegetables, dairy products, herbs, and wine. The most famous Macedonian dish is the “Shopska” salad which accompanies every meal and is made with tomatoes, cucumbers, onions, peppers, and cheese. Other traditional meals are the Moussaka an eggplant based dish, Tavče Gravče which is a traditional dish made of fresh beans and red dry pepper, Taratur which is yoghurt based cold soup, Shkembe chorba, a kind of tripe soup and many more. The restaurants in Macedonia also serve, besides the traditional dishes, international cuisine in order to please any guest. Whether you will choose, visiting one of the historical cities, go skiing in the mountains or relax in one of the fabulous spa resorts near one of the Macedonian lakes, you will certainly have the time of your life here in the Balkans.